Watch video clips from the red carpet and after party. In this scene Billy and his new assistant, Gabriella, are on their way to a gig. This is the first show they are doing together and Billy is very nervous. Making a cameo appearance is my friend of 30 years the legendary comedian Louie Anderson! Enjoy! September 24th at Brenden Theaters in The Palms. Red Carpet starting at 4 P.M. and Curtain Speech at 5:30 P.M.
LAS VEGAS (July 13th, 2015) – Produced and Directed by Lance Burton with screenplay by Lance and Michael Goudeau, “Billy Topit Master Magician” is not a biography of Lance Burton’s life but a fictional character in a fictional setting that happens to be set in Lance’s adopted hometown of Las Vegas. “The one thing Billy and I share in common is this, we both love magic and we both love Las Vegas. I guess that is two things actually” stated Lance. The cast of “Billy Topit Master Magician” is full of many of Lance’s friends, most of which are magicians, jugglers, comedians, as well as actors. Louie Anderson, Mac King, Robin Leach, as well as, Criss Angel all make cameo appearances. 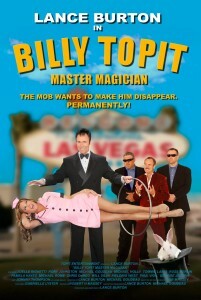 “When my dear friend Lance asked me to make a cameo in his movie (Billy Topit Master Magician), I was honored. When I heard my scene was a twisted nightmare – I thought perfect – I’m right at home,” said Criss Angel. Red Carpet arrivals at 4 P.M.
Curtain speech and welcome by Lance Burton & cast at 5:30 P.M. Variety, The Children’s Charity of Southern Nevada, (a 501 (c) 3 organization) works locally, nationally and globally to help children attain their full potential by granting practical equipment, programs and experiences that help children overcome whatever obstacles they face and live life to the fullest. All children are special, however, the core purpose of the Variety – the Children’s Charity is to connect people and companies to children who are less fortunate; children who live and grow up with serious illness, a disability or disadvantage. These are extra special children; children who require an extraordinary kind of help and support. That help and support is you and Variety – the Children’s Charity. Variety of Southern Nevada serves special needs children in the Las Vegas Valley and has donated in excess of $7 million worth of goods, services and money to children’s programs affiliated with dozens of local agencies. Shriners Hospitals for Children is a network of 22 medical facilities across North America. Children with orthopedic conditions, burns, spinal cord injuries, and cleft lip and palate are eligible for care and receive all services in a family-centered environment, regardless of the patients’ ability to pay. These hospitals, are known as “The World’s Greatest Philanthropy,” are owned and operated by Shriners International, formerly known as the Ancient Arabic Order of the Nobles of the Mystic Shrine, a Freemasonry-related organization simply known today as the Shriners. Patients must be minors under the age of 18 and are not required to have any familial affiliation with the Shriners order nor Freemasonry. The motto of all the Shriners Hospital for Children is “Love to the Rescue”. One of the main goals of Shriners hospital for children is to make sure none of their patients see a needle. They also give each child a specialized after surgery gift based on their personality. The Zelzah Shriners Temple of Las Vegas can be contacted at (702) 382-5554 or zelzahshrine.com. The Nevada SPCA, a nonprofit organization, operates a no-kill animal shelter, promotes humane education, makes referrals for lower-cost spay/neuter and vaccination services, and challenges people to be the best possible guardians for the companion animals in their care. We work to achieve our adoption goals by treating each animal as an individual, with a name instead of a number. We strive to match each rescued animal with people by personality and lifestyle in order to have the best chance to find a forever home. We seek homes for the animals where they will be treated, cherished, and appreciated as members of the family. For more information go to nevadaspca.org or call (702) 873-SPCA.